Okay I don't have time to do the maths on all of this, but I did notice that, two months into this season, we've finally taken down the Sons' 2016 record at Dodger games from our rugged sidebar. I dare say the 2016 record wasn't complete for all the Sons (it was for me! ), but for now, it's what we've got. The Sons have always done pretty well at Dodger games, to the point that one would think the Dodgers would invite us to every game. Alas, that hasn't come to fruition as of yet. 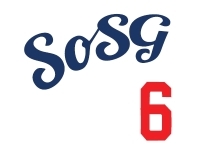 Prior SoSG attendance records: 2008 (18-15), 2009 (21-10), 2010 (9-8), 2011 (10-7), 2012 (24-18), 2013 (24-16), 2014 (22-12), 2015 (27-13).